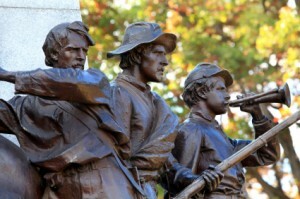 This week, one hundred and fifty years ago the battle of Gettysburg raged on in Pennsylvania. The battle was important, perhaps marking the turning point of the war, but of more lasting importance was the speech President Lincoln made five months after the battle ended. What it was remarkable about the speech is how it redefined the meaning of the war. Basically, Lincoln identified two reasons for which so much sacrifice needed to be made, one was to defend the idea that all men were created equal. The second reason was to defend the very essence of democracy, making sure that “government of the people, by the people, for the people, shall not perish from the earth”. Lincoln is recognized as one of history’s greatest leaders. He has indeed inspired countless other leaders. In this speech we see him in action doing what leaders need to do, assign meaning. In fact in this case we have a struggle that had already been going on for three years with many people thinking different things about why it was being fought. Lincoln identified an excellent communication opportunity when he knows that the eyes of the whole nation will be upon him, to reassess the reason why the North is fighting and communicate to his followers a new reason, one that is more profound, and one that makes more sense. How do you assign meaning? Find the time to reflect and ask yourself; why are we doing this? Work on getting it crystal clear in your own mind. Invest the time to define it so that all people could understand it. Chose the best medium for communicating this message. Chose the best moment and the best place to deliver it. Practice until your delivery is perfect. It is hard for me to think of any other leadership action more important than assigning meaning to the toil and to the sacrifices we ask our followers to engage in. How often do you assign meaning to the work you ask your people do?